A few of my meltmedia coworkers, dear friends and fellow bourbon enthusiasts have a private little bourbon paradise speakeasy we've established near the office. We call it, "Halcyon." If you visit, you can even get a shirt. It's a quaint little place with fine furnishings, a stock of bourbon that approaches my own, art on the walls, a life-sized concrete flamingo and a dozen or more flickering LED candles. But, therein lies the problem: Light. It's actually not that difficult as an idea, but in practice it turns out wrangling about 20 or 30 pounds of thick and odd-shaped bottles it a bit of work. The build time was about 20 hours, and the crazy thing is that the electronics part only took about 1 hours. Silly. I started out by gathering a bunch of "dead soldiers" of our favorite bourbons. The centerpiece is a big Costco-sized Willet bottle. Works great because of the wide base and super-tall neck. The other seven standard bottles are circled around the big Willet bottle. The thin wire in the photo above was to keep everything in-place while I worked around it. 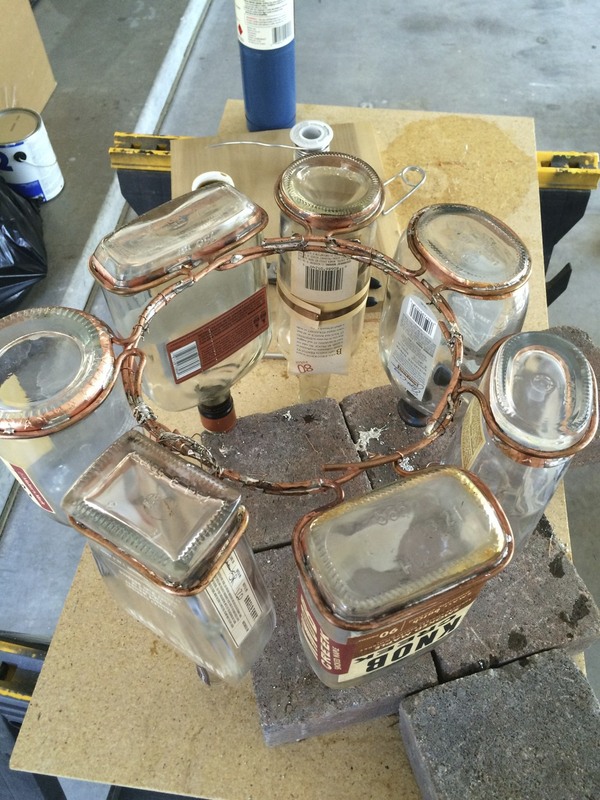 On the bottles that surround the center, I used copper tape to put rings of copper around the bases of the outside bottles. This would allow me to solder support structure to the bottles, instead of simple wrapping them with wire or some other kinda attachment that didn't seem super-sturdy. I was in a bit of a rush, so the soldering on this job looks poor. But, it's been holding rock solidly without a problem at all. Once all of the outside bottles had a way of "holding hands" around the center bottle, I arranged them around the Willet bottle and did a little more bending to get all of the support arms interwoven and ready for soldering. I had to turn the whole mess of bottles upsidedown to make it easier to solder all of the support arms together. ince the bottles were of varying height and shape, I had to make a jig (using that term loosely, of course) to get their bottoms (snicker) at the same level while arse-end-up. I bent and twisted the arms together to form as nice a ring as possible. I used thinner bare copper wire to wrap the pieces together to keep them in place while I soldered everything. It was a bulk solder campaign and beauty was not part of the strategy, as you can see. But, it turned out strong. I soldered the four support wires to the pipe around the neck of the Willet bottle. I left plenty of extry wire to bend and shape into something ornate-ish. I bought a big brass clipping hook from Ace Hardware and a copper reducing fitting. I drilled holes in four equally-space spots around the bottom, wider part of the reducer and two holes at the top for the hook. I made fancy-esque hooks our of the four support wires. I made a few little connector links out of the same wire and put them through the four holes in the pipe reducer piece. I made one more link to go through the two top holes in the reducer and wrapped the link through the brass hook's ring. By now, I was thinking this thing was starting to look like, "Frankenchandelier." But it had charm, so I kept at it. The labels on the bourbon bottles looked like too much, confirmed by my work wife Ron, also a bourbon enthusiast. So, off the labels came in a whirlwind of hot steam. These little guys are VERY bright, run on 3.2V to 3.4V and draw about 30mA. Easy to use. I soldered two-conductor wire to the ends of them and closed the LED end with some heatshrink tubing for good measure. The chandelier is dimmable using an app on the iPhone over Bluetooth. The controller in charge of running the light show is a LightBlue Bean from Punch Through Design. These are programmable over Bluetooth using the regular Arduino IDE. SUPER easy to program and use. It took me less than an hour to mock up the circuit on a breadboard and then encapsulate it in a plastic box. To make things super simple, I used a little 3.3V switching regulator and all the power for the whole chandelier comes from four D cell batteries. The regulator puts out a really clean 3.3V, which is right in the sweet spot for the LEDs and the LightBlue Bean runs happily on 3.3V, as well. The dimming of the LEDs is controlled through a MOSFET via PWM from the Bean. Pretty standard LED circuit there. 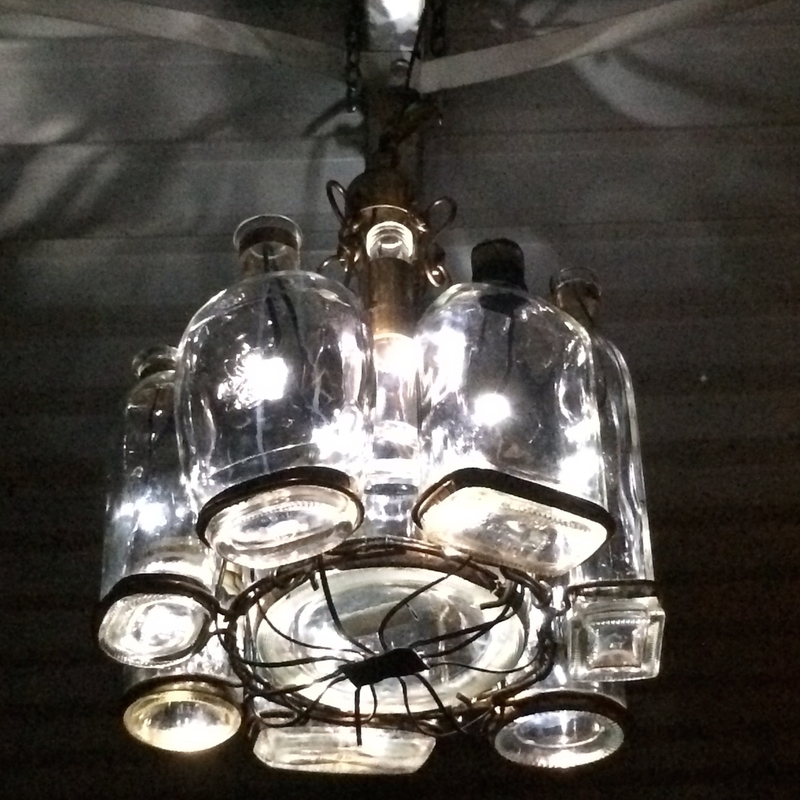 I strung the LEDs through the chandelier and into the bourbon bottles. All of the wires from each LED meat under the big Willet bottle and one from each was soldered to one side of a little piece of double-sided copper-clad board (same stuff I make printed circuit boards from). That side of the board was connected to ground in the control circuit. The other wires were connected to the opposite side which was then connected to the drain (load input) of the MOSFET. The gate of the MOSFET is connected to the PWM pin on the Bean. The source pin of the MOSFET is connected to ground. I cleaned up the wiring, put an "On/Off" label on the switch on the enclosure and gave the circuit one more look-over to make sure it would function on the first try. And then, it was time for the big test: Turn that puppy on and control it with the phone! Older PostDecember 2014 Office Chairiot Mark II Update: Electronics A Plenty!